In a move that shows Nokia also has things to gain from its deal with Microsoft for the Nokia Windows Phone, a Kinect-style gaming session with a WP7 phone was presented during Steve Ballmer's Microsoft keynote at the MWC today. Implemented as a part of the already excellent Xbox Live game center in Windows Phone, this thing has the potential to be a main selling point of Windows Phone. The built-in accelerometer and gyroscope in modern smartphones are like the ones that are powering the Kinect for Xbox 360 gizmo, thus unlocking similar possibilities in your smartphone. Whether or not it is a god idea to swirl, slash and throw your phone into the air, is another story, which for now will stay untold, as the concept is for the phone to just complement the Kinect gaming system. Not that both Google and Apple aren't working towards similar ideas for utilizing the motion sensors in your phone for some serious living room sessions, but Microsoft has been into gaming for a while now, so it will probably be very competitive in that area. 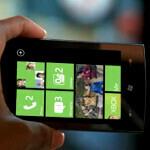 Have a look at Microsoft's promo video below, and tell us if you want this on your phone. The game showcased is a relatively innocent title, though, tennis games will have to come with a wrist strap connected to your phone, if things move out of Kinect and into your phone's motion sensors. This is cool, but completely unnecessary. I think Microsoft should put its focus somewhere else. Just like I think the 3d screen on your phone is unnecessary, but alot of people are going to like both. It's all in someones opinion. Mine is just mine. ANDROID is unbeatable windows 7 ...nice try. It may not be necessary now but who knows, in future it may be a 'must have' feature. For now it's a good start.